Spotify unveiled a global partnership with Coca Cola (s ko) Wednesday that it says will greatly expand its international reach and exposure, giving it a boost similar to the way its Facebook integration has supercharged sign-ups and usage. Under the deal, Coca Cola will use Spotify to help power its international music campaigns, giving Coke fans a way to experience new content and music created and curated by the beverage company. Spotify, however, had no new information on an eagerly awaited iPad (s AAPL) app. The initial signs of partnership will be a Coca Cola branded app that will appear on Spotify’s desktop app, and content from that app will also appear on Coke’s Facebook page. The app was selected from a hackathon this past weekend and will be ready in time for the Summer Olympics. Coca Cola will also utilize Spotify as part of a global music campaign next year, which will include TV, digital and other marketing efforts. The partnership doesn’t include direct payments from Coca Cola to Spotify. 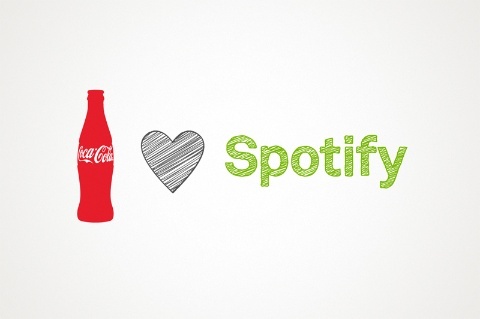 But Coke is expected to increase its advertising spending on Spotify as it promotes its app and expanded content. For Coke, the deal helps it better use music to get closer to its customers. It’s got music programs around the world, from live concerts to partnerships with big events like the World Cup and the Olympics. For Spotify, it means Coke will help promote it as the service moves into new markets beyond the 13 countries it currently operates in. “If you think about our vision, it’s about the ubiquity of music, and I can’t think of a brand or company that has the same amount of ubiquity as Coke,” said Daniel Ek, Spotify’s founder, at an event in New York. It’s unclear how much this will improve Spotify’s financial situation. The company doubled its losses to $60 million last year. Even with expanded distribution, it will still be on the hook for bigger payments to labels. Getting more advertising will certainly help pay the bills, but it’s not clear how big that revenue source will be. So far, Spotify has paid more than $250 million to the labels overall. Spotify currently has 10 million users on its free ad-supported service and 3 million paying subscribers. But clearly, Spotify is working to get closer to brands. Earlier Wednesday, Spotify founder Daniel Ek confirmed that Spotify is turning on the ability for brands like McDonalds (s mcd) and AT&T (s t) to make their own apps on top of Spotify’s platform, letting the them create new experiences around its catalog of 15 million songs. This follows Spotify’s move in November to open up its platform to third-party apps including apps from Rolling Stone, Last.fm, SongKick and others. The service is still limited to just apps built off of Spotify’s desktop app. AT&T is (s ATT) one of the first out of the gate with a “Surround Sounds,” app, which shows where songs were written, recorded, played or performed, so users can see the music visually on a map. Reebok has an app that creates workout playlists while Intel (s intc) has an app called “Sifter” that recommends songs, bands and artists based on what they’re friends are tuning into on Facebook. The apps will show up in the coming weeks. These branded apps are free to build but the hope is that they will help attract more advertising dollars to the platform, similar to the way Facebook pulls in advertising dollars from brands building off its social network. Spotify released some new usage figures including the fact that since integrating into Facebook, it’s had 1.5 billion shares from Spotify to Facebook and more than 500 billion impressions on Facebook. Users have spent the equivalent of 1,500 years on Spotify’s apps since the launch of its app platform. 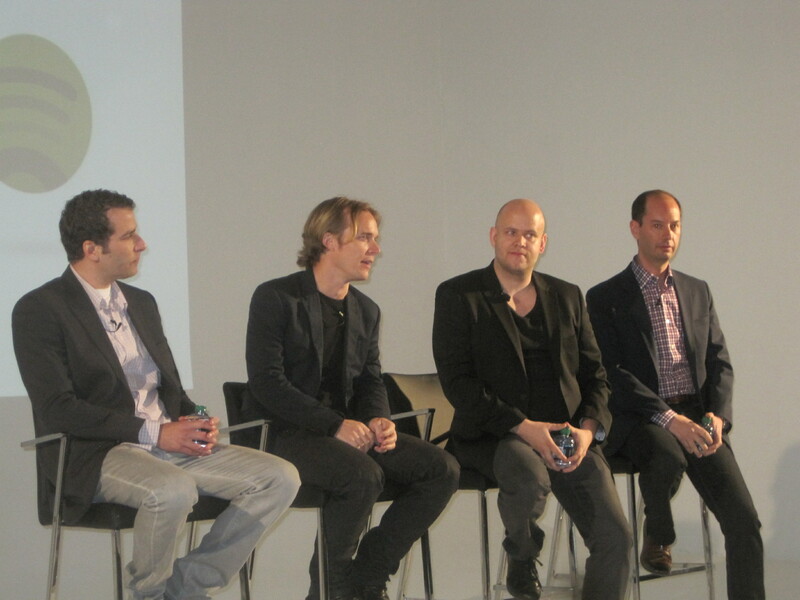 Users have created 700 million playlists on Spotify and are listening for 100 minutes a day. As for a dedicated Spotify iPad app, Ek said it was still in the works. No, we haven’t updated our badly broken desktop and mobile apps, and no we still don’t have an iPad app, but here’s some goofy advertising tie-in that positively no one but Coke executives and Spotify investors will care two bits about.